More commonly known as Ozark Pippin, Deaderick originated in 1850 on the farm of Benjamin Ford of Washington County, Tennessee. In 1896, it was first described under the name Deaderick to avoid confusion with an apple already named Ozark. 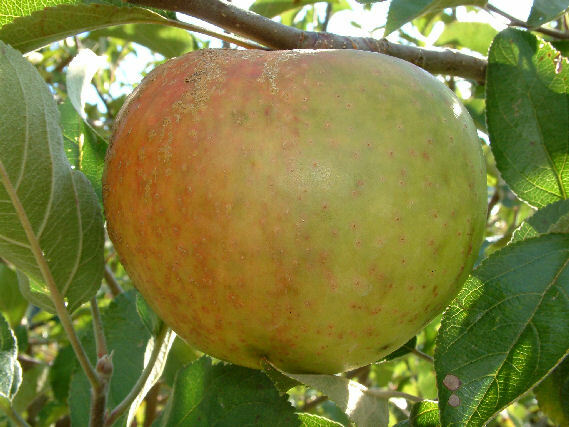 According to Calhoun (1995), the apple was rediscovered in 1992 in Tennessee under the name Ozark Pippin. Close study of this apple showed it to be Deaderick. Fruit is large, slightly conical, sometimes with unequal sides. The tough, smooth yellow skin will have an occasional pink blush and frequent large, reddish spots. The mild, yellowish flesh is fine-grained and juicy. Ripens in the fall and stores well.